Nick and Trenna Briscoe dated in the late '60s while at UT. One day, Nick thought the moment was right for their first kiss. 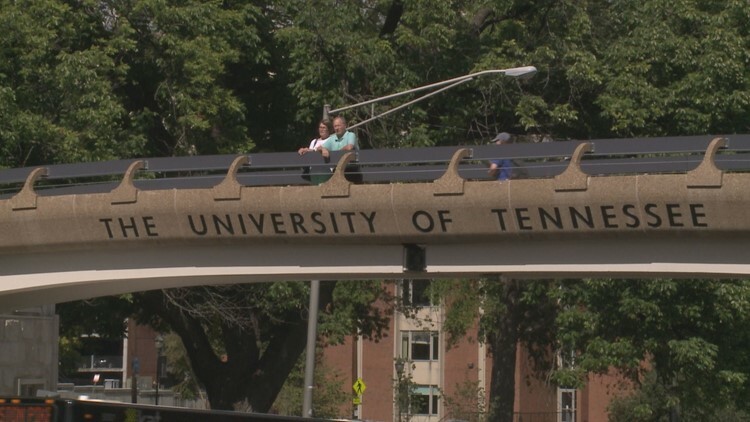 On Thursday, some 50 years later, they drove to Knoxville to do it all over again. 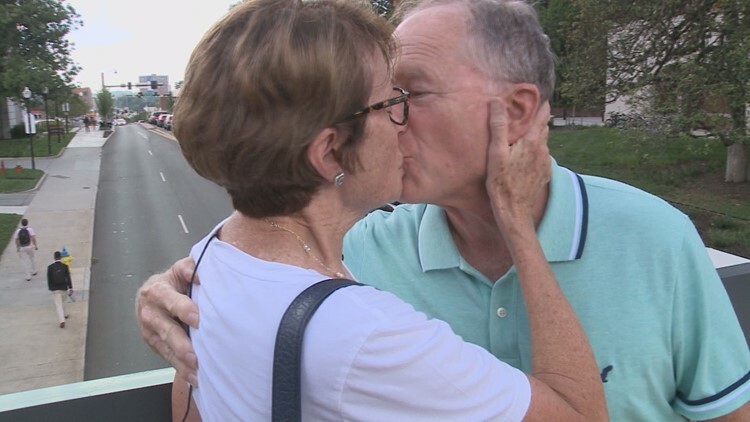 Knoxville — After Hurricane Florence forced an Ohio couple to cut short their beach vacation, they came up with a romantic way to salvage the trip: Head to the University of Tennessee to recreate the first time they ever kissed, more than 50 years ago. In the late '60s, Nick and Trenna Briscoe were UT students who met in calculus class. She was from Nashville and he was from Columbus, Ohio, although he had family here in Knoxville. Nick was a charmer. He had his eye on Trenna, a transfer from what was then called Memphis State University. "His story was he was tired of blind dates, and he picked me out of the room and decided to sit next to me," Trenna recalled Thursday afternoon as she stood on the pedestrian bridge over Cumberland Avenue with her husband. First, he started tutoring her because he was better at calculus than she was. Then they flirted. Then they started dating. It was on the Cumberland Foot Bridge, a well-known 1965 landmark that spans Cumberland between Volunteer Boulevard and 17th Street, that Nick one day decided to make his move. Suddenly, as fellow students walked on by and traffic passed below, he turned her around and they embraced. If Thursday's reenactment was any indication, sparks definitely flew. "I was thinking, Mmmm, that felt right," Trenna said. "So we continued to date and -- again -- ended up in a 50-year marriage." In 1969, Trenna graduated with a bachelor's degree in education. Nick, who had been majoring in electrical engineering, left UT that year just shy of graduating. They soon married and ended up moving to Ohio. Jump ahead to the present. The Briscoes, now the parents of three sons and grandparents of four children, were vacationing at Myrtle Beach, South Carolina. Florence, meanwhile, is menacing the Carolina coast, forcing the evacuation of hundreds of thousands of people in North and South Carolina and Virginia. The couple obviously couldn't stay at the beach, so they decided to swing through Knoxville as they headed back home to Reynoldsburg, Ohio. The Briscoes like to come back to campus every five years or so anyway. This time, Trenna pretty much demanded they go to the bridge to recreate that first kiss. "Lots of ups and downs over 50 years, of course. But this university has served us well," she said. "It allowed me to be a teacher and had some very good experiences from that." Looking back, Nick said modestly, "I don't know whose idea the kiss was -- probably mine." "Oh, I'm sure it was," Trenna said, adding: "And it's been a wonderful journey." With that, they shared yet another kiss.